These are way easier than gardening! Well… For me at least. 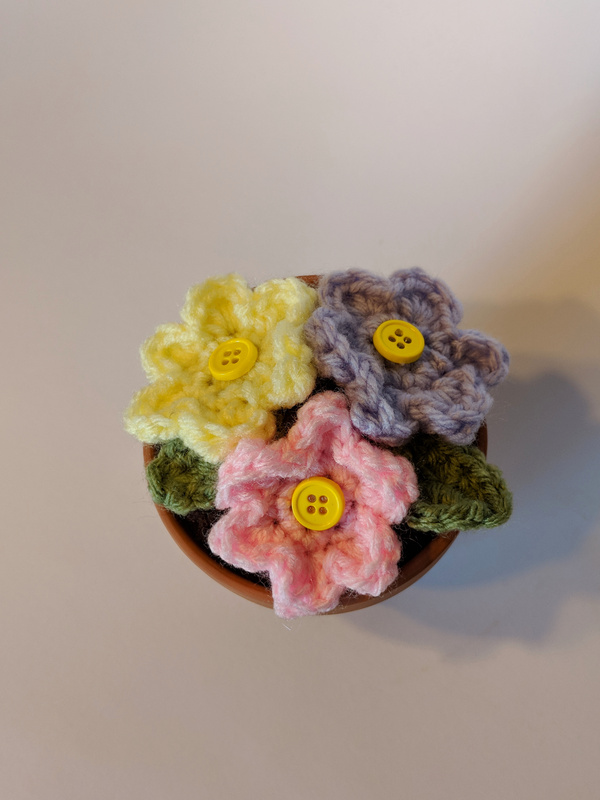 I wanted to make a nice variety of flowers that could bring forth a lot of color and variety to any room of the house. 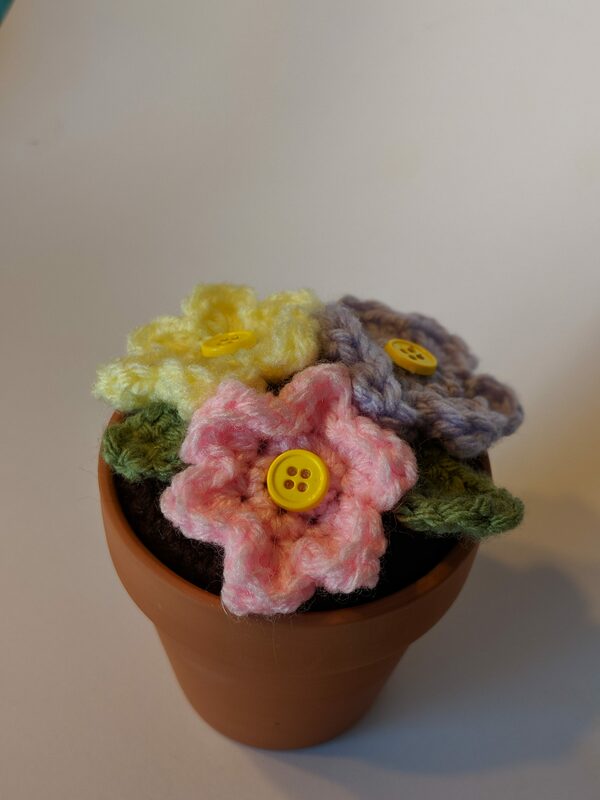 I also wanted something that could make perfect gifts for any flower enthusiast. Perhaps something nice for mom or the perfect addition to any new home? These work up very quickly and the possibilities for variety are endless! 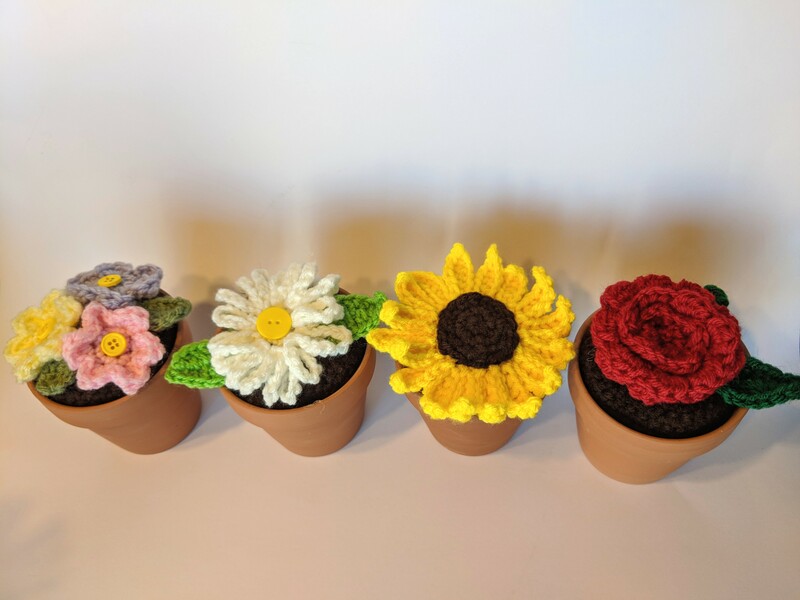 Best yet, all you need are a few different colors of yarn and a super easy to find, affordable terra cotta pot (I found mine at the local Dollar Tree). With all that said, let’s move on to the fun parts, shall we? ***For each of these patterns I used a terra cotta pot that was sized 3.5-4 inches in diameter. At this point you may want to check the width of the “dirt” to see if it fits well into your terra cotta pot. Depending on the size, you may want to add more stitches, though remember that once it is filled with polyfil stuffing, it will expand a bit. Begin to stuff piece here. Round 12: Continue to dec until piece closes. Fasten off and weave in ends. Set aside and move onto your chosen flower portion of the pattern. We will work in steps. Step 3: Here you will begin the petals. Sl st. In next st you will insert the following: *hdc, dc, tr, dc, hdc. Sl st in the following st*. Repeat for a total of five more times for another five petals. Once you have completed you should have six petals in total. Fasten off leaving a long tail for sewing. Step 2: In 2nd ch from hook you will work your way down with: sl st, sc, hdc, dc, hdc, hdc, sc in each of the 7 ch spaces. Do NOT turn. Step 3: You will work your piece on the other opposite side of the ch spaces you just worked. In the next 7 ch spaces work: sc, hdc, hdc, dc, hdc, sc, and finish off with a sl st. Fasten off leaving a long tail for sewing. ***Scroll all the way down for the final step. Terra cotta pot that is around 3.5-4inches in circumference. Step 2: In 3rd ch from hook hdc and continue to hdc in every ch sp for a total of 58 hdc altogether. Ch 1 and turn. Step 3: Sl st in 1st st. Place 3hdc in the next st. Sl st. Repeat until you reach the final 2 sts. Place sl sts in each of the remaining 2 sts. Fasten off leaving a long tail for sewing. Step 4: For this rose you will take the end with the tail for sewing and begin to coil the piece. Carefully sew it together so that all parts overlap and resemble a rose. Do not fasten off yet. ***Scroll all the way down for the final step. Step 2: In 2nd ch from hook you will work your way down with: sl st, sl st, sc, hdc, dc, dc, hdc, sc, sc in each of the 9 ch spaces. Do NOT turn. Step 3: You will work your piece on the other opposite side of the ch spaces you just worked. In the next 9 ch spaces work: sc, sc, hdc, dc, dc, hdc, sc, and finish with a sl st in each of the last 2 sts. Fasten off leaving a long tail for sewing. Step 3: sl st in 1st st. Ch 10. sl st in same st. Ch 10 again. Sl st once more into the same st. This will create your first petals. Step 4: Repeat step 3 all around for a total of 18 more petals. Finish with a sl st. Fasten off leaving a long tail for sewing. Step 3: You will work your piece on the other opposite side of the ch spaces you just worked. In the next 9 ch spaces work: sc, sc, hdc, dc, dc, hdc, sc, and finish with a sl st in each of the last 2 sts. Fasten off leaving a long tail for sewing. ***Scroll all the way down for the final step. Step 4: sl st into next st. Repeat step 3. You will have 18 flower petals once you’ve finished. Fasten off and weave in all ends. Round 2: sc in 1st st, inc in the next st; repeat around (18) Fasten off leaving a long tail for sewing. ***Scroll all the way down for the final step. Spring Flowers: Attach each leaf to opposite ends of the dirt piece. Arrange and sew your flower pieces over top of the leaves, still allowing them to show a little, as well as covering the dirt piece. 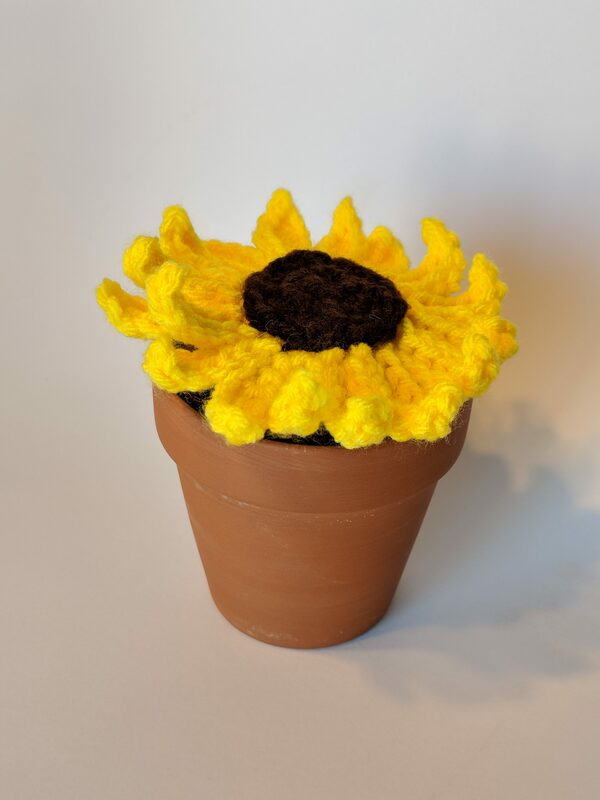 Take your hot glue gun and sew your three yellow buttons on top of your flower pieces to complete the look. 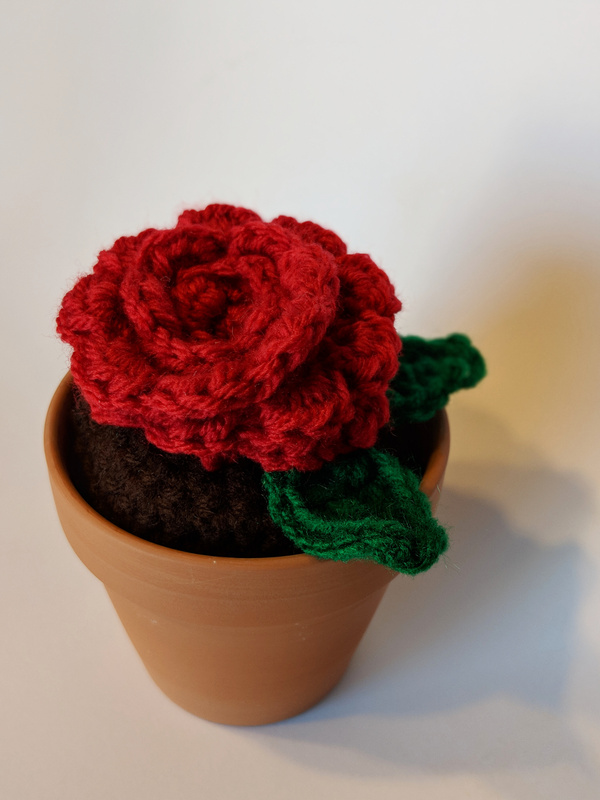 Rose Flower: Choose one side to attach your leaf pieces on the edge of your dirt piece. 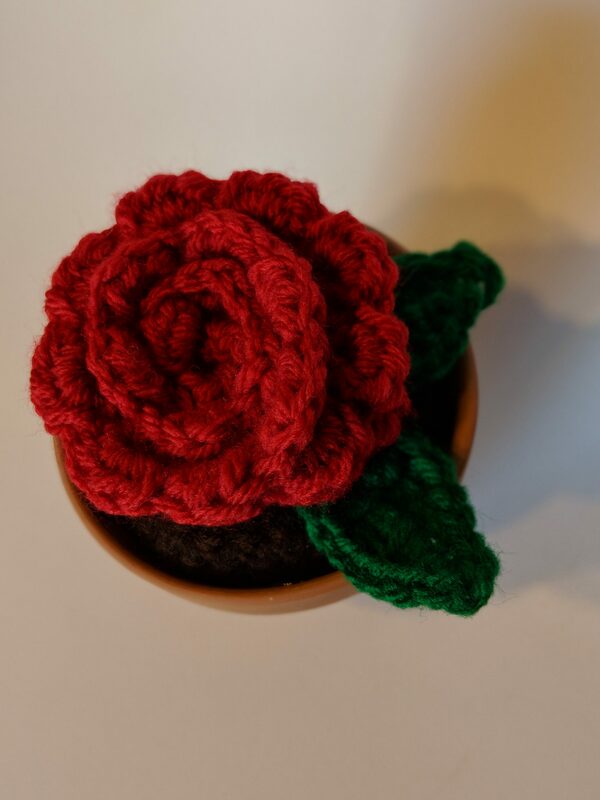 Sew your coiled rose on top of the dirt piece and leaves, making sure that the leaves still show. Daisy: Attach each leaf to the opposite ends of the dirt piece. 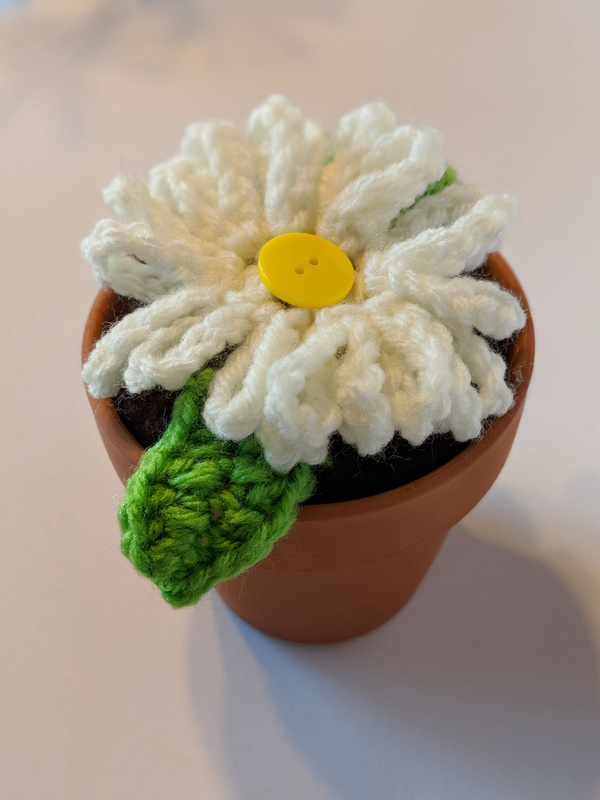 Sew your daisy on top of the dirt piece and leaves, making sure that the leaves still show. 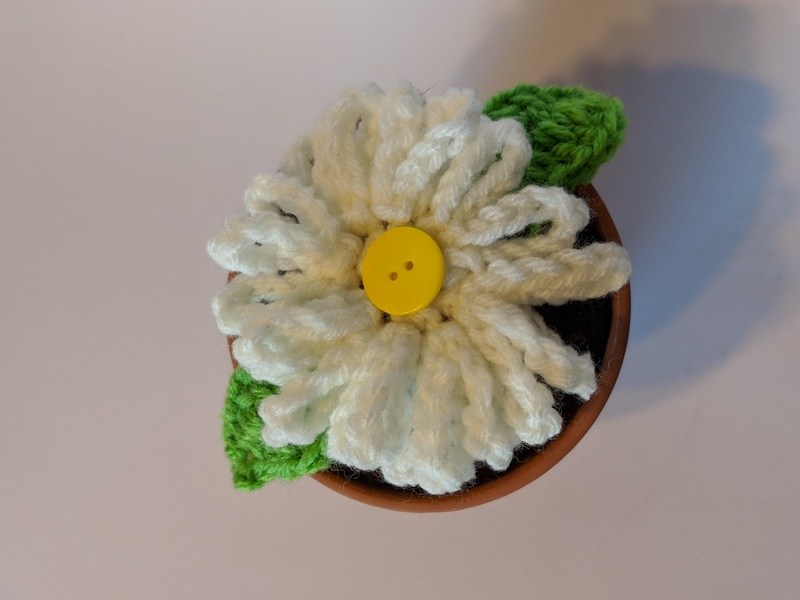 Hot glue the medium sized yellow button to the center of the daisy flower piece. 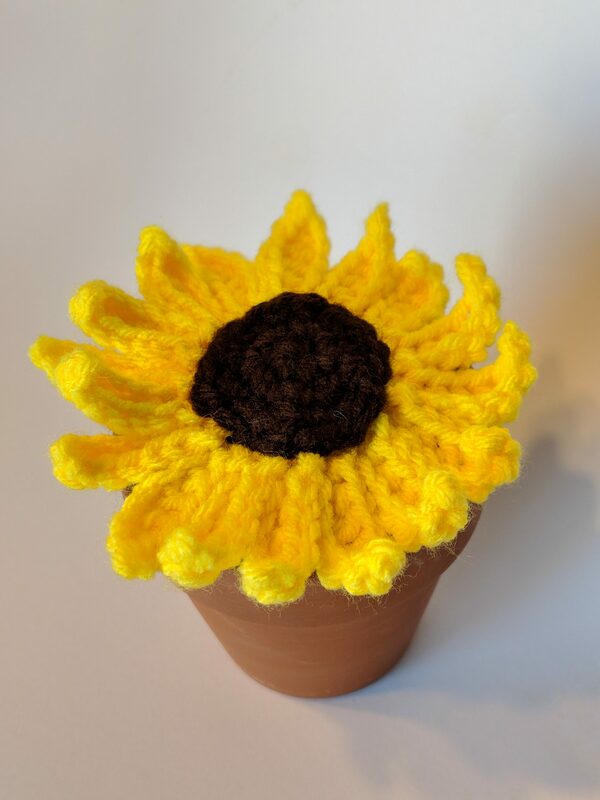 Sunflower: Attach the brown sunflower head to the middle of the flower piece. Attach the flower piece to the dirt piece. Quickly press your dirt piece into the terra cotta pot. It should have a snug fit. Wait a couple minutes for the hot glue to dry. 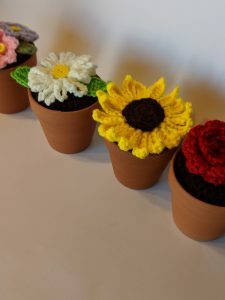 After that, your crocheted potted flowers will be complete! And really, that’s all there is to it! 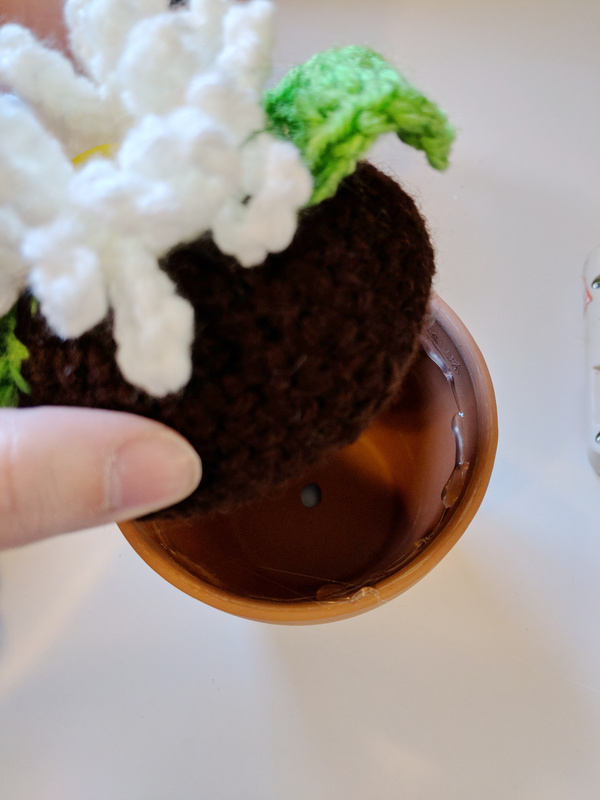 These are great because you can really make any flower work and if you’re like me and sorely lacking in gardening skills, you can still enjoy a house full of plants and flowers! 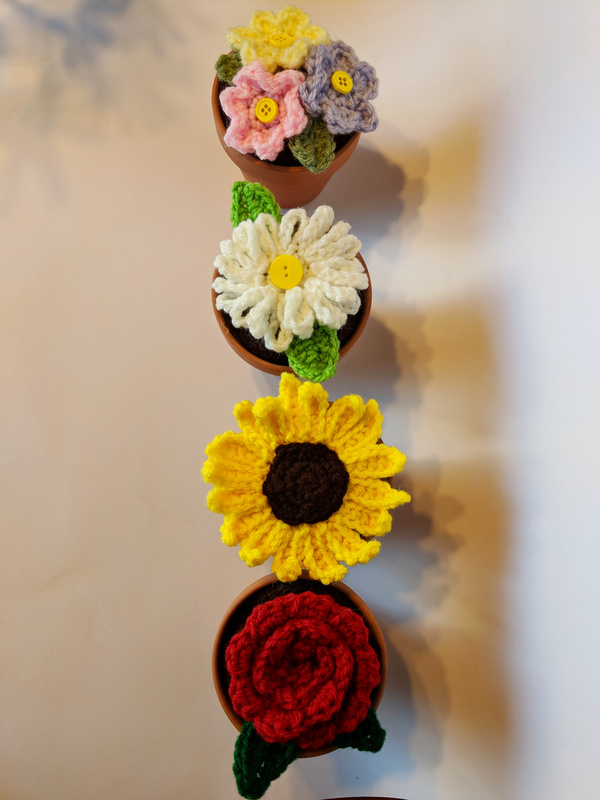 Enjoy your spring and happy crocheting!